Joe and I just got back from theater weekend in New York City and sadly, no Meryl sightings. This afternoon she was on the west coast to attend the Academy Award nominees luncheon in Beverly Hills. Normally I wouldn't consider this news a "postable" event, but it's been a slow week and I found a few pics of her on the red carpet. 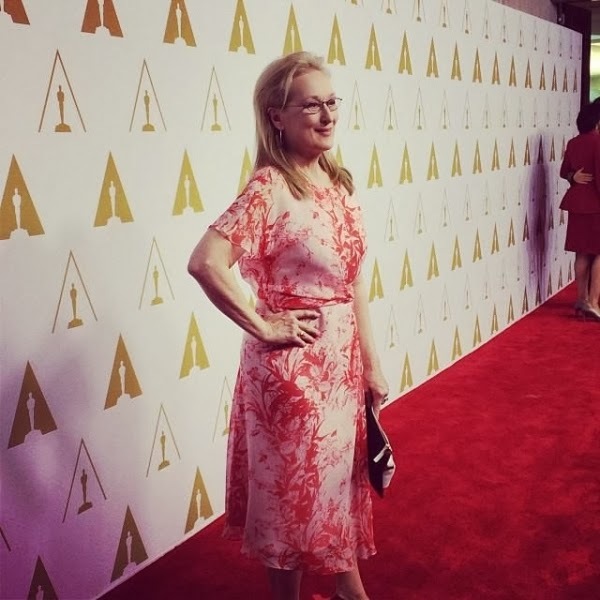 Lookin' good, Meryl. It's also been reported that Meryl will be joining director John Wells this upcoming weekend in Paris for the French premiere of August: Osage County. Currently the film has grossed just shy of $50 million worldwide. I am actually a little surpirised the film hasn't done bigger business so far given it's decent-sized release. I expected it to be a fair sized hit instead of just respectable given the stars involved. At least it's going to hit higher than Doubt! Yeah, it's made its budget back, but I expected it to do better as well. It's not a blockbuster type picture. It's respectable, even if may be a bit disappointing for the producers. Shoulda Coulda Wouldas #11: "Mary Stuart"